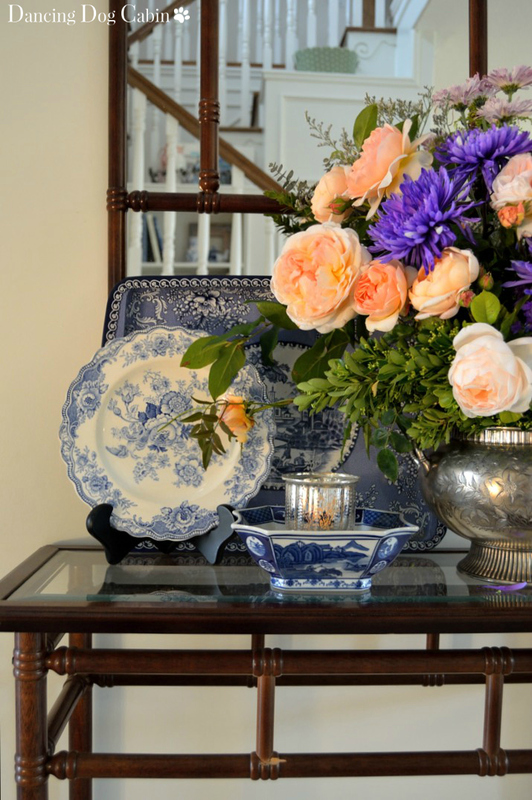 There is nothing like fresh flowers and greenery to add life and loveliness to your home. The scent, the color, the texture... all these things add that special element that makes a room come alive. 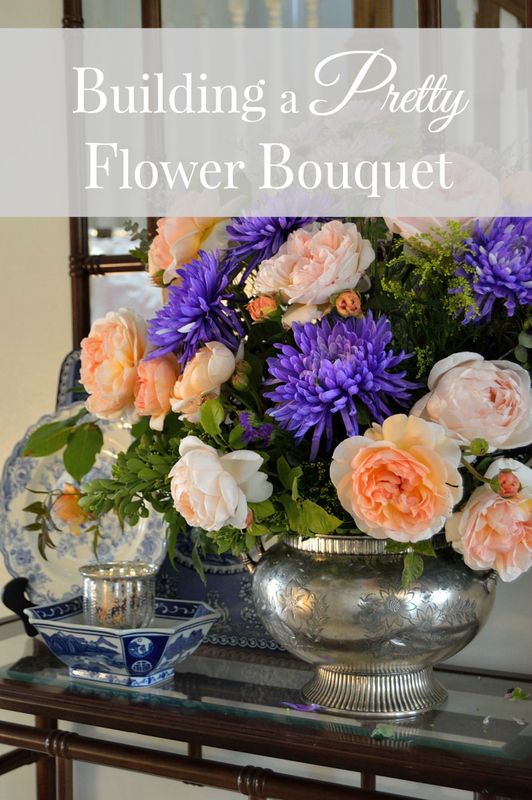 You can create a beautiful flower arrangement easily using what you have in your garden or by supplementing store-bought blooms by following a few simple steps. 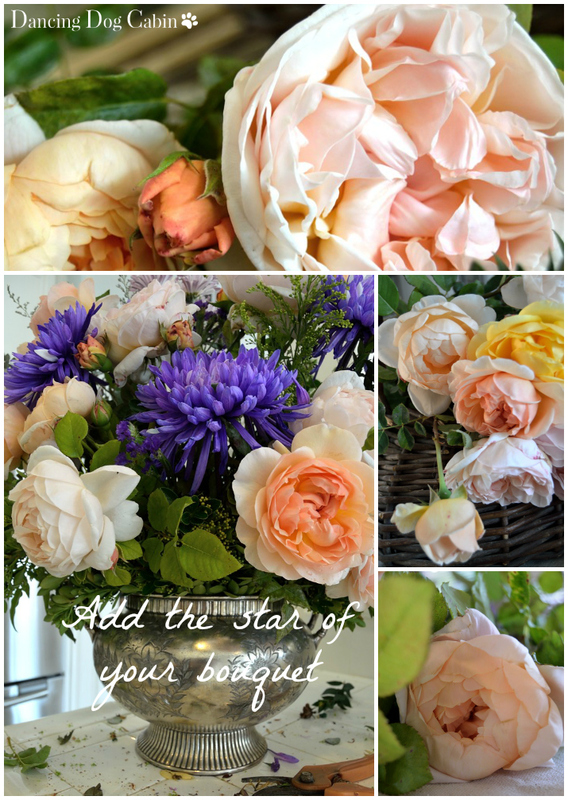 Today I'm providing a quick tutorial for 'building' a pretty flower bouquet. Additionally, using 'wet' floral foam placed in your vase or container gives you more control over the placement and arrangement of your flowers and greenery-- this is handy for shorter, broader vases like the one I've used here. You poke the stem into the foam and the flower stays put instead of flopping over or falling out of the vase all together. Floral foam is available at craft stores such as Michaels or JoAnn (this is not a sponsored post) and can be used multiple times. 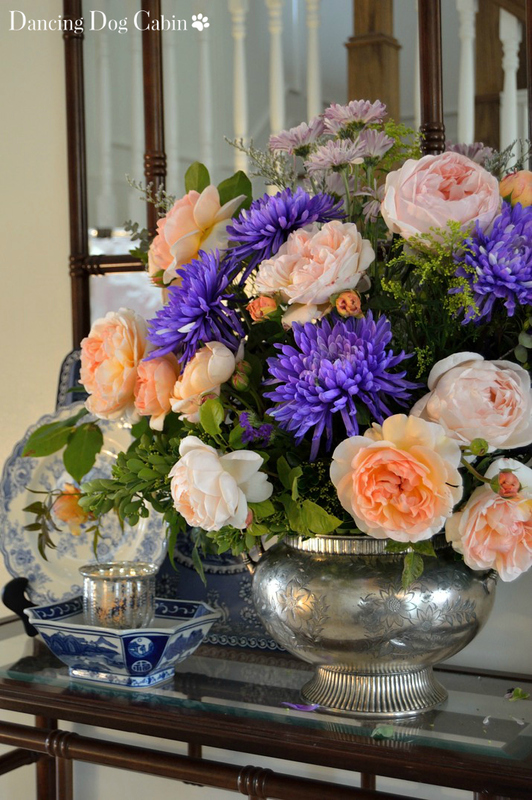 For this flower arrangement, I used roses from my garden to supplement foliage and flowers I purchased from the floral section of a local grocery store. 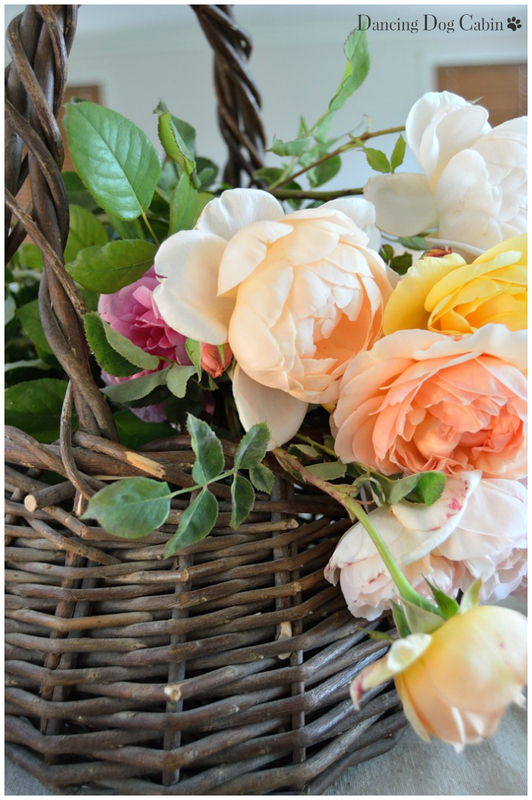 I've let my garden go in recent years and only my roses seem to be flourishing with the minimal care that they get.... so this is a great way for me to create a fantastic looking arrangement without having to maintain a cutting garden. 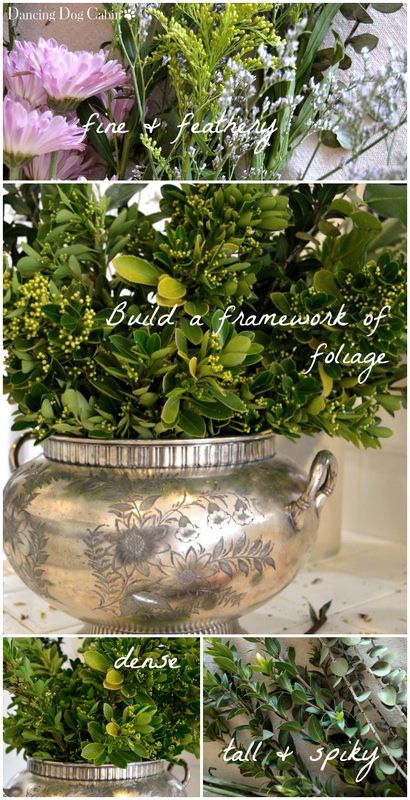 First step... create a framework using a variety of greenery. The framework should include a mix of dense, fine/feathery, and tall/spiky foliage that adds that varied and textural backdrop that will showcase and complement the supporting and starring flowers. Second step....add the supporting color that complements the starring flowers that will be the focal point of your arrangement. 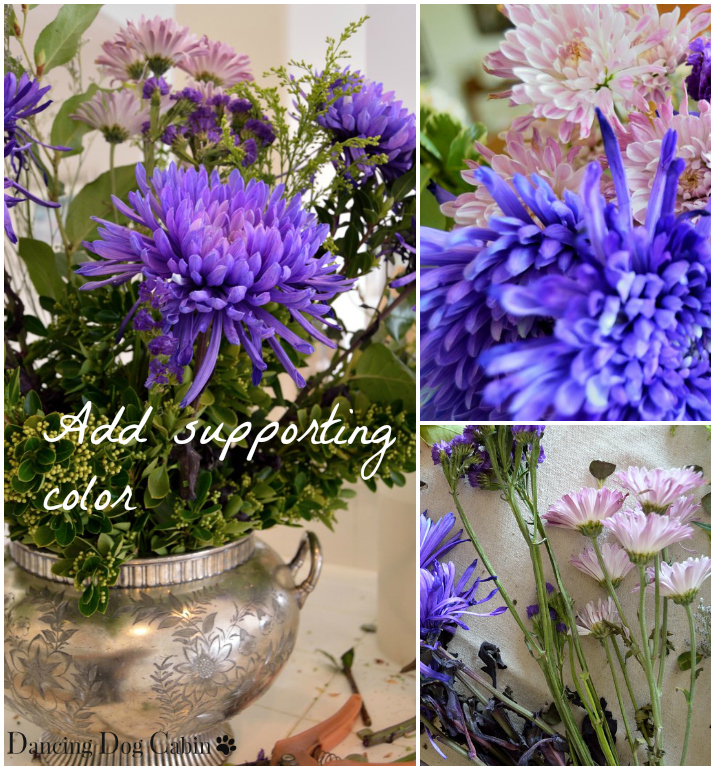 I'm using purple and lavender colored flowers.. spider mums (I think), chrysanthemum, and statice. Last step... add those special flowers that will have the starring role in your arrangement. In this case I used a mix of my favorite roses from my garden (all David Austin): 'Evelyn', 'Tamora', and 'English Garden'.... all in varying shades of peach and peachy-pink, which looks beautiful with the purples and lavenders of the supporting flowers, and the varying deep greens and chartreuse colors of the foliage. And of course, once you are all done, set your arrangement where you can enjoy it. 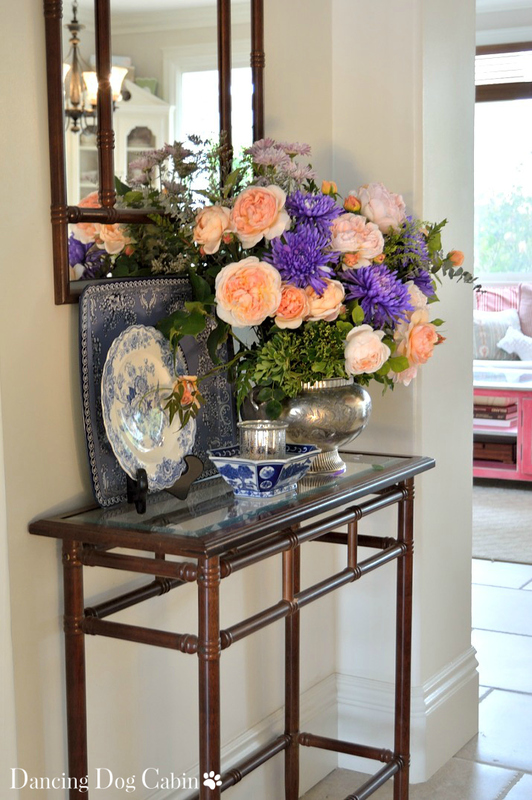 In this case my flower arrangement sits happily in our front hall where we can enjoy its color and scent when we come and go throughout the day or go up and down the stairs. What a pretty arrangement! 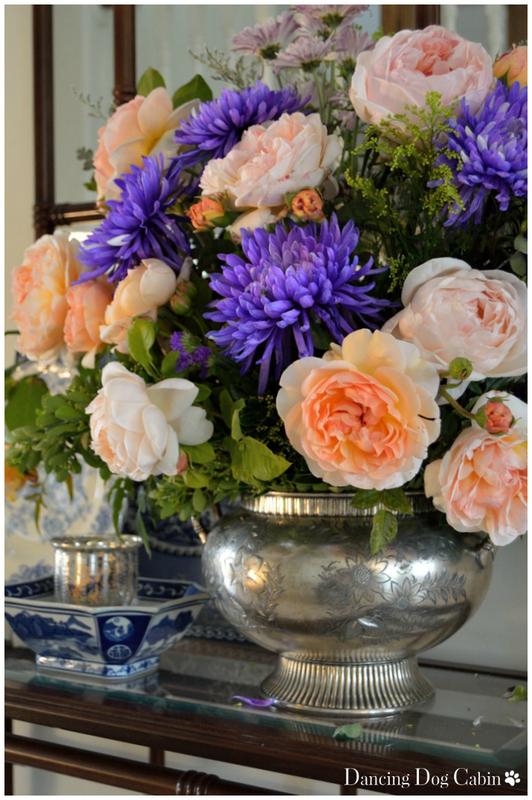 I just love those garden roses!! 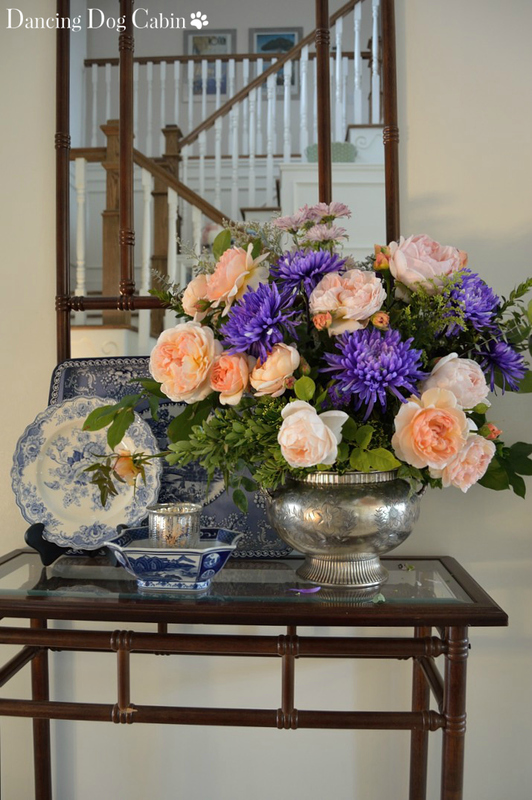 I love the look of garden roses better than florist roses! Thank you Angelina! Yes, I prefer garden roses to florist roses too. Thanks for visiting. What an informative--and beautiful--post. Your roses are stunning. Your flower arrangement is so pretty! I love the colors and especially the great tips for making your own. I'm the worst at arranging flowers! Yours looks so pretty in that silver bowl. This is absolutely stunning! 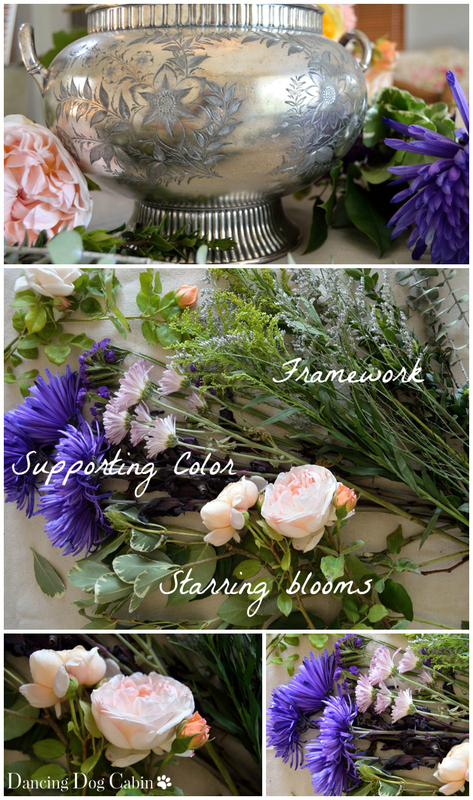 I love floral tutorials, and I like the way you explain things. Thanks for the inspiration! Found you at Feathered Nest. Thank you for featuring me and thank you for hosting Carolyn! What a gorgeous bouquet. Peaches and purples are so beautiful together. I am a big fan of austin roses; I have about 32 roses here in the new rose garden. It is a lot of work but it is worth it. Thank you Stacy! DA roses are my favorites-- just love the repeat blooming, hardiness, and gorgeous, fragrant (mostly) blooms. Stunning! You make it look so easy, Melissa! Just letting you know I'll be featuring your flowers tonight on Best of the Weekend! Hope you'll come back and link up tonight! 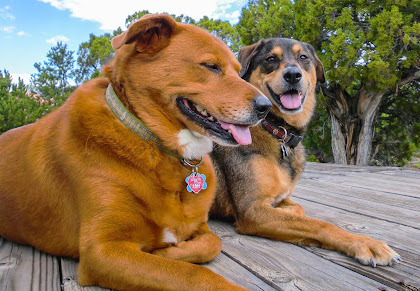 Amy, thank you for your kind words and for featuring me on Best of the Weekend!